For more than 25 years now, Only Natural has been following a two-fold goal: offering original, high-quality and affordable goods to Western consumers, and at the same time improving the living conditions of the artisans in India. All of the products are inspired by the traditional skills of the artisans. Through the ages, they have dedicated themselves to making products to earn a living and have developed true mastery of their trades. They have passed their skills on to the next generation and thus created the many family companies that are so typical for India. But this mastership is being threatened. Young people nowadays are more interested in moving to the cities where money is earned in other ways. With their projects Only Natural aims to support local initiatives and time-honoured customs and trades, in order to keep the traditional handicrafts alive. Embroidered pouf. Denim blue coloured cotton with bright coloured embroidered flowers. Size D50 xH20 cm. Fairtrade. Lime green cotton pillow with coloured flowers, with different coloured sides. Size 45x45 cm. Fair trade by Only Natural. Fuchsia cotton pillow with crochet coloured flowers, with different coloured sides. Size 45 x 45 cm. Fair trade by Only Natural. Cushion in owl shape. Pink. Made of nice soft wool. Handmade and fairtrade from India by Only Natural. 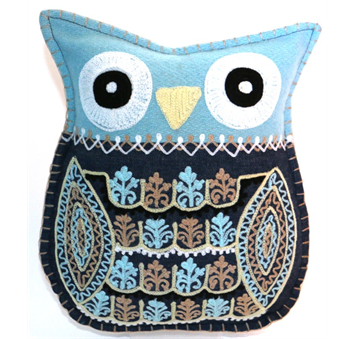 Cushion in owl shape. Green. Available in many colourtypes. Made of nice soft wool. Handmade and fairtrade from India by Only Natural. Cushion in owl shape. H 60 cm x W 50 cm. Orange or grey. Made of nice soft felt. Handmade and fairtrade from India by Only Natural. Cushion in owl shape. Grey witk pink, yellow and blue embroidery. Felt. Handmade and fairtrade from India by Only Natural. Cushion in owl shape. Available in three colourtypes. Made of soft felt. h 25 x 20 cm. Handmade and fairtrade from India. Aluminium round bowl. Diameter 45 cm x height 11 cm. Handmade. Fairtrade from India. Cushion dear. Black, ecru and white elephant. 45 x 45 cm. Fair trade by Only Natural. Cushion dear. Black beige white zebra. 45 x 45 cm. Fair trade by Only Natural. Soft cushion in blue or pink with sheep. 45 x 45 cm. Fair trade by Only Natural. Soft cushion in ecru and black with a woolen sheep. 45 x 45 cm. Fair trade by Only Natural. Soft cushion in blue or pink with sheep. 50 x 70cm. Fair trade by Only Natural.